MARCH 22: The Suns have made it official, announcing Fredette’s new deal today in a press release. 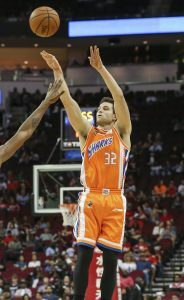 MARCH 21: The Suns have reached an agreement to sign former lottery pick Jimmer Fredette to a rest-of-season contract which will include a team option for 2019/20, reports John Gambadoro of Arizona Sports 98.7. Because Phoenix has an open spot on its 15-man roster, no corresponding move will be required to create an opening. The move is not yet official, as Fredette still requires clearance after spending the 2018/19 season in the Chinese Basketball Association, tweets Shams Charania of The Athletic. That should happen soon. Once Fredette officially finalizes his new deal with the Suns, he’ll be back in the NBA for the first time since the 2015/16 season, when he appeared in just six games for the Pelicans and Knicks. Since then, the 30-year-old guard has made a name for himself in China, where he has put up huge scoring numbers for the Shanghai Sharks. In 43 games this season, Fredette averaged a league-leading 36.9 PPG, 5.6 RPG, 5.4 APG, and 2.6 SPG. Although he never developed into a reliable rotation player in 235 games for the Kings, Bulls, Pelicans, and Knicks, the former BYU star has said that he feels as if he’d succeed if given another opportunity in the NBA. Given how often teams are launching three-point shots these days, Fredette’s outside touch should be an asset — he made 38.1% of his three-point attempts in his previous five NBA seasons. The Suns will now have a full 15-man roster, with all 15 players on guaranteed contracts. The exact terms of Fredette’s deal aren’t yet known, but if he signed for the minimum, his non-guaranteed 2019/20 option would be worth just shy of $2MM. Give Jimmers the chance to shine. He’d be a good second option to Booker. * Said after watching Fredette score 52 points in the Mtn West tourney semi final, while only shooting 2 free throws. That doesn’t change the fact he might still b one of the best shooters in the world. But he can’t guard the guy who sweeps the floor during dead balls. That’s always been his problem. 2) Now his TBT summer tournament team just got worse. Typical Suns signing. Why don’t they bring in former Sun’s player Maciej Lampe too; whom after a stellar NBA career avg. of 3.4 pts is lighting up the Chinese League this year for 25 pts per’ game, and he is now 34 y.o.! Says something about the competition over there, doesn’t. This is nothing but an end of the season ‘gimmick’ signing. But, Suns fan will fawn over it. I don’t like David D’s sour comment. It’s not bad that Suns signed Jimmer, dude… It’s good. I want to see it myself.